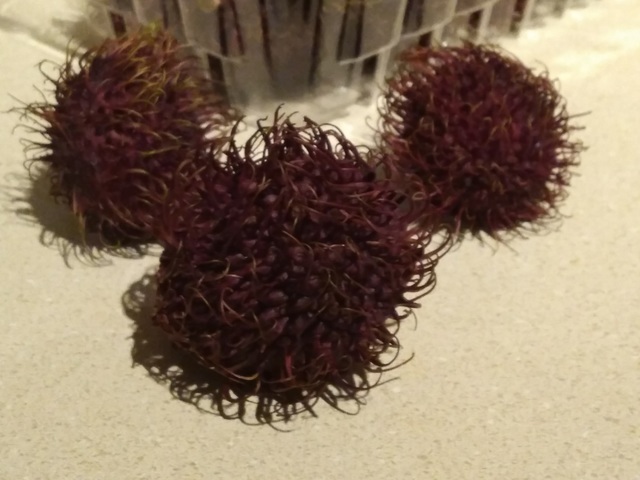 I had a similar feeling here in the U.S. when I stumbled upon a container of rambutan in the produce section of a Walmart in Orlando, Florida. Yes, Walmart. 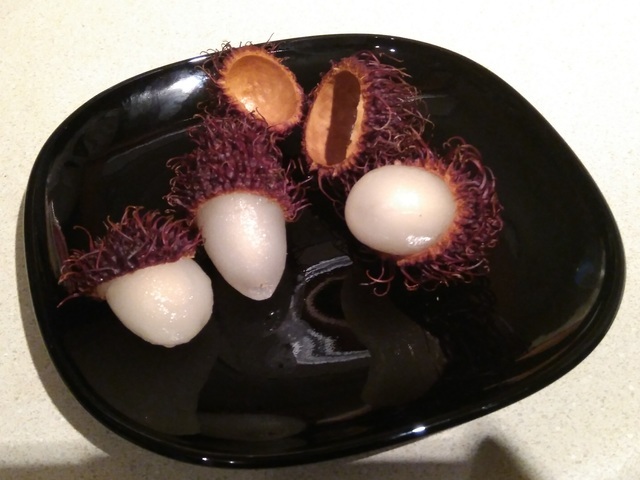 Yes, rambutan. I was so excited! I was also a bit skeptical. The fruit looked tired. If it had been in China (or Thailand or Malaysia), I would have passed them up. Their little spikities looked too dry, like they had been sitting out for too long. My hesitation didn’t last long, though. I was too happy. 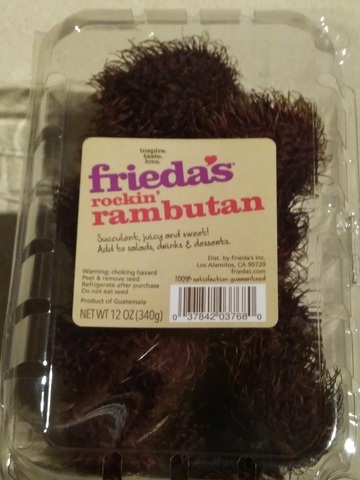 Plus the label claimed they were ROCKIN’ rambutan. That alone probably convinced me I needed to give them a try. I am happy to report that they were good! The flavor and juiciness were just like I’d expect in southeast Asia. The biggest difference was that the flesh did not separate from the seed very easily, which was something new. 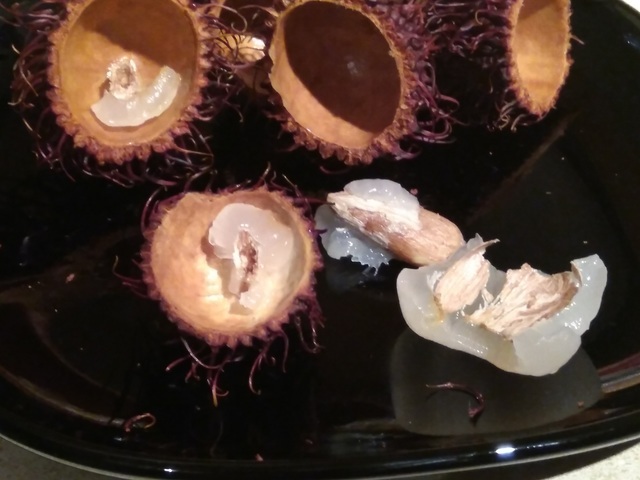 A lot of it stuck, and the seeds cracked in half with nearly no pressure at all. I guess that is the price you pay for having them shipped over a long distance. That plus the actual price you pay. But they were yummy. Yummy enough for me to pay another five bucks when I saw them again at another Walmart in Arizona. October bonus: If you cut them around the equator and remove half of the shell, you end up with a really creepy monster eyeball with red spiky eyelashes growing out of its eyelid. So, what are the things you have overpaid for because you were missing them so much? Which things do you miss when you’re in your passport country vs. your host country? Get notified when the next Small Town Laowai post is ready. 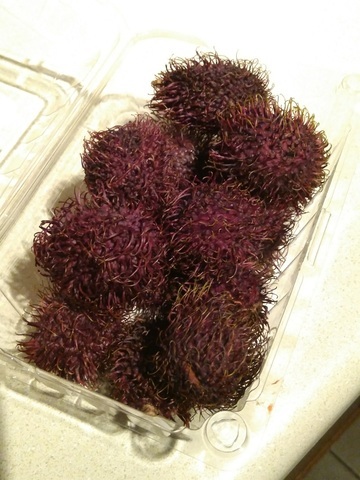 Wow, they were yummy at your Nanning house, and I’m amazed to hear they are here, too! Ah, the multi-storied Walmart in Zunguo that resembles a dollar store on steroids! In Bangkok,my daughter-in-law(K10) gave me instructions for shopping for Christmas dinner on my first visit to Bangkok. As directed from my list I was able to get 5 sweet potatoes plus other items.Upon arrival at home the lady helping was putting things away and then screeched an unsettlingly scream. She had seen the bill and I had paid $30(US)(900BHT) for 5 sweet potatoes..re $6 each. Oh well ,as time went buy my dear daughter-in-law tried to help me,a long time single retired bachelor. I DID get better as I had no where to go but up.